This molecule is derived from azulene by addition of two sulfurs and two oxygens at positions 2, 6, 1, and 5 respectively. I would like to learn the proper procedure of numbering. I tried googling around and reading papers but could not find the correct terminology for this process. If your aim is to know just the chemical name, you may ask a computer. If the chemical already is known, chances are you find it in a data base (e.g., reaxys by Elsevier, or Scifinder by The American Chemical Society). The later even has the option to draw a structure and to request a naming for it, even if there wasn't yet a publication indexed by SciFinder about said molecule. A resource you typically find in Chemistry departments. There are standalone programs helping you to find a chemical name for this structure. 2,6-bis(sulfanyl)azulene-1,5-dione, if you ask ACD Chemsketch (here, the freeware was used [free in the naming up to 50 atoms]); but Perkin Elmer's ChemDraw, or ChemDoodle -- often accessible within a campus wide license program by an university -- likely find it / generate it equally well. If you aim to learn the nomenclature by yourself, the handy pocket guide by Helmchen may be worth to consider. Portions of it may be seen in googles book preview, like the screen photo taken below. 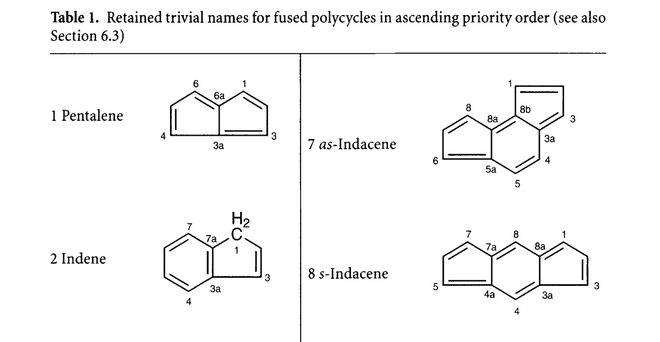 The rules for numbering of bicyclic compounds such as azulene are given in Nomenclature of Organic Chemistry – IUPAC Recommendations and Preferred Names 2013 (Blue Book). Because of this, the two rings need to be horizontally aligned with each other in the preferred orientations. Note that this rule alone does not distinguish between the two orientations on the left. P-25.3.3.1.1 The numbering of peripheral items in the preferred orientation starts from the uppermost ring. If there is more than one uppermost ring, the ring furthest to the right is chosen. Numbering starts from the nonfused atom most counterclockwise in the ring selected and proceeds in a clockwise direction around the system, including fusion heteroatoms but not fusion carbon atoms. Each fusion carbon atom is given the same number as the immediately preceding nonfusion skeletal atom, modified by a Roman letter 'a', 'b', 'c', 'd', etc. The ketones in your molecule have greater seniority over the thiols (P-41), and hence the ketones are expressed as the suffix (leading to a name ending in "dione") instead of the thiols (a name ending in "dithiol"). Note that if the thiols are deprotonated this seniority ranking would be reversed, as anions have greater seniority over ketones (hence you would have a name ending in "bis(thiolate)"). As you can see, the manual generation of such names is in no way trivial. Most people use software to automatically generate names, which is generally sufficiently clear for the chemical community to understand them. However, it should be mentioned that these automatically generated names are not always the preferred IUPAC names: for example, ChemDraw 16 gives "2,6-dimercaptoazulene-1,5-dione" as the name, even though the prefix "mercapto" is no longer recommended (P-63.1.5). Difference between oxygens in a carboxylic acid? Possible to Calculate Electronic Charge Distributions/Densities for Organic Molecules?